How to write a good return policy? What return options should I offer? Should I offer free returns? How long should my return window be? Should I go live with a customer-facing portal right away? Did you know that more than 80% of online shoppers now read the return policy before buying? This means that your return policy, and how it's written, is now a great tool to increase conversion. Here are a couple of tips to make sure your customers do not get scared by your return policy. You can create different policies for international versus domestic customers, sale items, high order values, defective items, etc. This will allow you to advertise free returns, but still protect your profits. This will help your customers read a policy that applies to them directly very quickly, so just make sure your policy displays those segments well. For example, you can choose to offer only gift card refunds for sale items, or free returns only for orders above a certain cutoff value. It's really important that your customers do not have to read a whole contract to go over your return policy. They should be able to find easily in which segment (discussed above) they fall in and what that entails for their returns. You want your customers to get a consistent experience throughout your website, so write your return policy with that in mind! Your return policy should be very clear and simple, using your overall brand voice. Using more complex words will only confuse your customers, and they might feel like you are trying to trick them. The key here is for your customers to trust your brand. As a general rule, the more return options you offer (refunds on the original payment method, store credits, exchanges), the more control your customer feels they have on the return, and the better the experience. Our answer to this question is always "Yes, but". Advertising free returns is a very good conversion tool, but it's not always something viable for your business. In that case, segment your customers, and make sure to offer free returns to your most valuable customers. Their experience will be enhanced and you will be protecting your profits. The longer the better! And surprisingly, this is not only awesome for your customers, it's also very advantageous for you. Here's why: a shorter return policy creates a sense of urgency for your customers. With a shorter return policy, your customers know they need to request a return quickly if they want to get a refund, so they may not have the time to get familiar with your product. Also, if they are uncertain about keeping your product, they will most likely request the return. However, if your return policy is longer, then your customers will be able to get familiar with your product and may end up just keeping it, or even forget about requesting a return! Of course, one of the goals using Return Magic is to reduce customer support tickets concerning return requests. However, some merchants prefer to start with a more manual process and have customers reach out to them before making returns a self-service process. This can be very useful if you want to have a hands-on approach at first to understand the intricacies of why your customers are returning, and to make sure your return policy is adapted to their expectations. In this case, you can absolutely still use Return Magic and have the return portal be your internal tool to create returns for your customers and still have labels + emails automated. Once you are ready, you can go live with your portal and have customers use the portal themselves. You can also choose to manually approve your returns (or only certain returns!) to have more control over the number of requests. This might be a good intermediary between using the portal as an internal tool and having all returns be automatically approved. 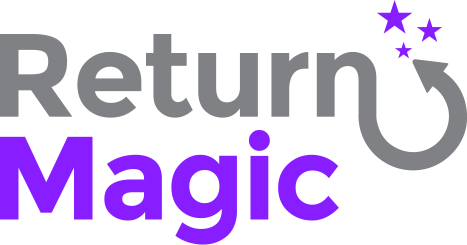 I you have any tips and tricks concerning return policies, feel free to share them with us by commenting below or reaching out to us at support@returnmagic.com!